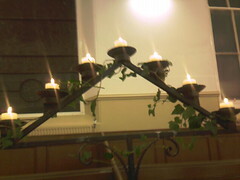 St Columba’s Church was packed to capacity for a candle-lit carol service on Christmas Eve. 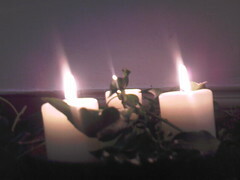 The early evening service included 9 Christmas carols and 9 Christmas Bible readings. 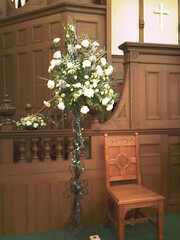 It also featured a sung duet, a violin and keyboard duet, a clarinet and keyboard duet, and an organ and keyboard duet. Christingles were lit, and “Silent Night” was sung by candlelight alone, with the aid of the church’s new data projector, used today for the first time. 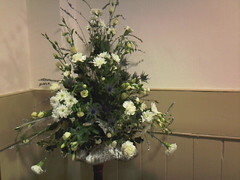 An offering was taken in aid of the Alzheimer’s Society, raising over £300. 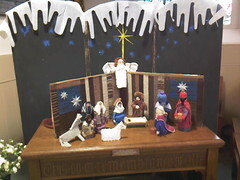 St Columba’s young people presented a different angle on the Nativity service to a packed church on Sunday 20 December. The children and young people sang, read and acted out the story of Jesus’ birth beautifully, but this year with an extra dimension. We were invited to consider how the story might have played out from the point of view of a slightly less wise man, who spent so long on various distractions that he missed the opportunity to visit Jesus. Our minister, Revd Liz Blair, summed up by challenging listeners not to miss out on the message of God’s love at the heart of Christmas by being distracted. 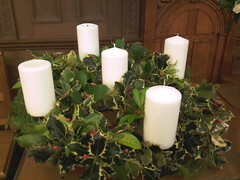 St Columba’s Church wishes a happy Christmas to everyone visiting our church or our website. 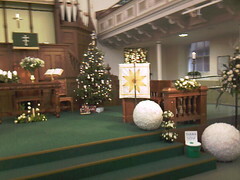 St Columba’s Church was transformed into a winter wonderland for our seasonal flower festival. 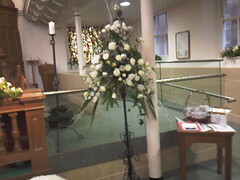 The church was decorated with four large and a dozen small displays of flowers to coincide with North Shields’ annual Victorian Christmas Market, taking place in Northumberland Square in front of the church on 12 and 13 December. 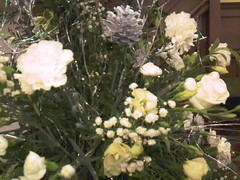 The display included white roses, carnations, chrysanthemums, gypsophila, and variegated holly, along with five large white ’snowballs’. 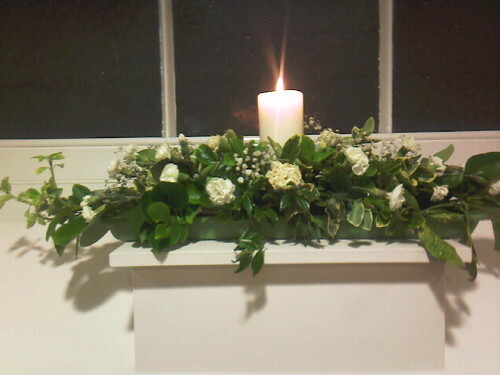 Our doors were opened to visitors, who were able to enjoy soup, scones and tea in the church hall, and visit fair trade and handicrafts stalls, in addition to viewing the flowers. 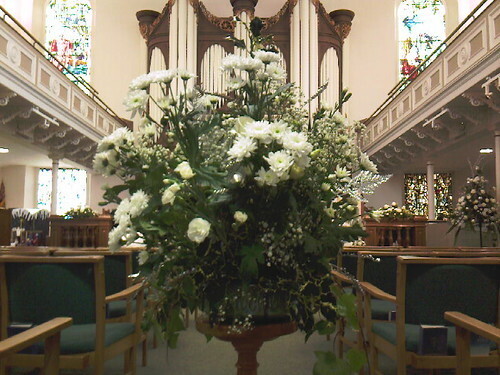 On the Sunday morning, our service took on a Victorian theme. We sang Christmas carols from the Victorian era, and the service featured a costumed Victorian Christmas sketch, based on Charles Dickens’ novel “A Christmas Carol”. In her sermon, Revd Liz Blair reflected on what she called a “cultural disease” in modern society, whereby people feel compelled to chase after money and success without finding contentment. She challenged the congregation not to ignore the poor and vulnerable, but to rebuild friendships and work for a fairer world. Scrooge had been trapped in a prison of his own making, bound up by the consequences of his past actions and experiences, but God can release us from our fears and help us to make a fresh start, she said. 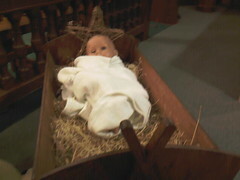 Worshippers were invited to come back next week to see the Nativity story re-enacted. St Columba’s has collected 230 boxes of Christmas presents for children in poor countries. 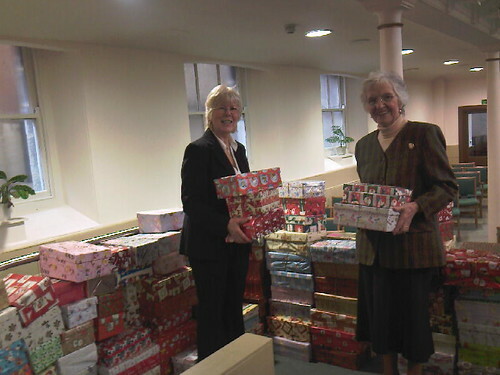 Our church has supported the annual shoebox appeal for 10 years, and 2009 was no exception. Operation Christmas Child is a project run by British charity Samaritan’s Purse. Last year, over 1.2 million presents, gift-wrapped in shoeboxes, were sent from the UK to children in Africa, Eastern Europe and Central Asia, regardless of their background or beliefs. 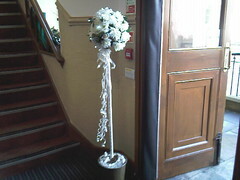 St Columba’s Church sees its mission in showing the love of God as he is known to us through Jesus Christ. By enabling children in impoverished parts of the world to experience a little of the joy of Christmas, we are able to fulfil part of our mission. The boxes are packed full of such gifts as dolls and cuddly toys, balls, toy cars, coloured pens and paper, combs, toothbrushes and paste, soaps and flannels, sweets, gloves, scarves, sunglasses, and jewellery. In a service held on Sunday 22 November, the congregation watched a short DVD, showing the work of Operation Christmas Child, and how much these gifts mean to children who in some cases have never had any presents before. Junior Church Coordinator, Mrs Shirley McKay, spoke of the huge difference between our world in North East England, where everything is available to us from supermarkets on our doorstep to running water in the home, and other parts of the world where unavailability is the daily reality. Next week, the boxes will be taken to the local collection point in Byker, before being loaded onto lorries for the long trip across so many countries. 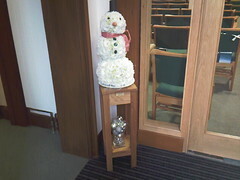 In the same week, the church had raised over £1,000 at the Christmas Coffee Morning organised by its ladies’ group, HANDS, for children’s charities Smile for Life and ME North East; and its associated Scout Group, the 4th Tynemouth (Congers), had raised £265 at a coffee evening for Children in Need. Also in the morning service, some of the church’s children and young people performed a puppet show, with the characters miming to the song “Reach out to God”. 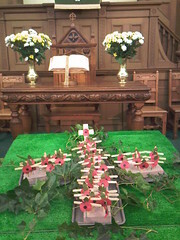 Our morning Remembrance Sunday service this year was all-age worship, and was led by our Minister, Revd Liz Blair. In a thought-provoking service, we were asked to consider how we ourselves would be remembered by generations to come, and we were encouraged to be peacemakers, ready to spread forgiveness and reconciliation. At 11.00, one of our Second World War veterans hung a poppy wreath on the war memorial, and we kept the two minutes’ silence, begun with the sound of a bugle playing the last post and reveille. The children and young people read out the names of those of our church who had been killed in the two World Wars, and planted poppies in a cross formation at the front of the church.